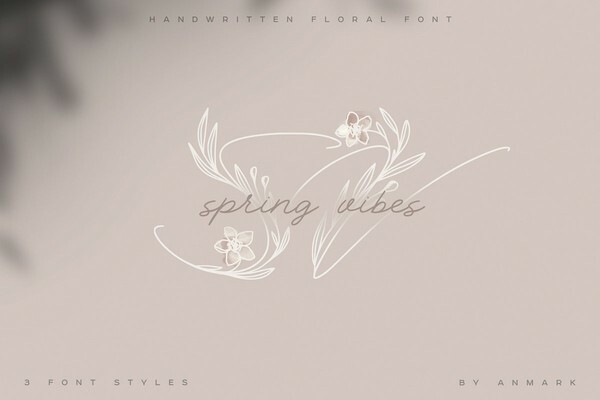 Spring Vibes Floral Font is an elegant, decorative, feminine handwritten font. Uppercase letters with flowers and leaves are ideal for your wedding monograms and logos. Use this font for wedding invitation, branding, packaging, magazines, florist shops, social media, restaurant menu, greeting cards, web header and many more. Spring Vibes Floral Light. This is a lightweight version of the floral uppercase letters. This calligraphy font style is more light and gentle. It's perfect for wedding design projects, instagram, watermarks, titles, birthday invitation and other. Spring Vibes Regular is an elegant script font. Use this modern font for flyer, banner, packaging, social media, signatures, quotes, letterpress address, jewelry, hotel business, signatures and more. You will receive a nice BONUS - decorative botanical elements and wreaths. They are perfect for decoration of your monograms, logos, cosmetics packaging and much more. BONUS: 12 floral elements (AI, EPS, PNG black on transparent background and PNG white on transparent background).